Cedartown's annual Fall Festival is coming up this weekend, and those who want to come out and enjoy the annual Shrine Parade should find a spot to park and get to the Main Street sidewalk before a 10 a.m. start. Locals and visitors alike should be able to find parking off of Main Street without a problem and ought to stop by and enjoy what promises to be a busy day for all. The festival itself will kick off at 9:30 a.m. with the first half a Hair and Fashion show being put on in front of F.H.F. Hair Design at 303 Main Street, with the parade to follow, and the second half of the fashion show after at 10:45 a.m.
Saturday's fashion show in front of the Main Street salon is being put on by F.H.F. Hair Design, The Brave Sparrow and Nicki's Dress Up Boutique. The plans are to showcase what is in store for fall fashions available at The Brave Sparrow and Nicki's Dress Up Boutique, as well as the hair and make-up transformations undertaken at F.H.F. Hair Design. Events continue throughout the day with a Dog Show put on by the Cedartown-Polk County Humane Society in the south Main Street park, an 11:30 a.m. finale of the fashion show in front of F.H.F Hair Design, and then dance performances from 1 to 1:45 p.m. put on by the Cedartown Academy of Performing Arts Dance Studio at the Holloway Park stage. Downtown Cedartown Association Executive Director Ramona Ruark said it's nice to see the festival have a lot more to offer for visitors and local residents alike. Ruark added around 50 vendors with a variety of arts and crafts, food, and more for sale will be lining Main Street this Saturday. "We'll have our food court between Ed's Cleaner's and the Coca-Cola building on Main Street," Ruark said. Additionally, the day includes the Polk County Historical Society's archaeology day for youth ages 6 to 10 to allow them to participate in an 'Artifact Dig' for $2 each. Each junior archaeologist will get to keep one item that could range from shark teeth, glass beads, or even arrowheads. The museum will also be hosting the Throttle Jockeys in their parking lot to give visitors the chance to see classic and antique cars from bygone days. Visitors will also get to enjoy watching arrowheads being made and spinning cotton on a wheel as part of the festivities as the museum's new location at 117 West Ave. The 41st annual Fall Festival is hosted and sponsored by the Downtown Cedartown Association. Live music will also be among the attractions for the annual event, held in Cedartown each year on the first weekend in October. Businesses downtown will also have sidewalk sales and specials during the festival. When local prosecutors head to trial on a case, they usually do so with only one thought in their mind: get a conviction so justice for a victim can be served. It's not easy to get the win when some defendants come to trial and stand accused by victims without a lot of evidence or witness testimony to prove what happened. Especially when those victims are children, and the accusations made involve unspeakable violations committed by adults. Yet that's the job of Assistant District Attorney Jordan Amendola (formerly Stover,) who pointed to her latest conviction against a Cedartown man accused of child molestation in late 2016 as one of the reasons why her job is hard but rewarding at times. Ronald Shirey, arrested on Christmas Eve 2016, was found guilty on charges of child molestation, cruelty to children in the first degree and sexual battery of a person under 16 after the trial concluded last Thursday, Sept. 27. He'll face sentencing on the trio of charges in late October, according to Amendola. The charges stemmed from a December 2016 incident where Shirey was accused of molesting a 14-year-old female relative in a house with 17 different people living under one roof, and others in the room at the time according to Amendola. She said it was a rare case where all the pieces lined up as they should: victim is willing to come forward, physical evidence from exams following the incident were available, and eyewitness testimony placed Shirey in the room and committing the crime. "We definitely almost never have witnesses in a child molestation case," Amendola said. Having a lack of evidence or witnesses when accusations are made of child molestation is a problem District Attorney Jack Browning is fully willing to admit makes gaining convictions difficult. comes down to a child's word against an offender's word. A jury can sometimes get nervous about the thought of taking the word of a child over an adult. So when we get a conviction on these, it's kind of a big deal to us." He added that "It's always the focus of our office to prosecute these cases and try to bring these folks to justice. We never lose focus on that. We also have to be mindful of how difficult these cases are to prosecute." Sometimes it's a lack of evidence, or testimony that makes convictions difficult. Other times, it is because accusations are made against people who are considered trusted friends or family members, and those can be difficult for people to both believe and pursue. It isn't stopping the Tallapoosa Circuit District Attorney's office from pursuing the cases, however. Amendola has become the "resident expert" according to Browning within the District Attorney's office on child molestation cases, having won three so far, and two of those just this year. There's plenty more where that came from, Browning said. The trial calendar remains full of examples of difficult prosecutions for child molestation cases. "These cases are the most heartbreaking to lose, but when you win them it's the most rewarding thing about this job," Amendola said. The DA's office also has programs in place like victim advocacy, which provides people who have suffered from crimes of all kinds to give those individuals a voice in the process, as well as partnerships with organizations like the Sexual Assault Center of Northwest Georgia. However, the first step toward winning those cases is that a crime is reported at all. Anyone who has information about child predators are encouraged to call police now and report what they know, by either dialing 9-1-1, or calling local law enforcement on nonemergency lines. The Polk County Police Department can be reached at 770-748-7331, the Cedartown Police at 770-748-4123, and the Rockmart Police at 770-684-6558. Susan Grout is a breast cancer survivor and her husband John is a business professor at Berry College. "That costs money and it is all the more admirable that Floyd is not going to cut that cost, because I think knowing in 24 hours is a wonderful gift to the community," he added. Dr. Paul Brock, a general surgeon with Harbin Clinic who was instrumental in the creation of The Breast Center at Floyd, agrees with Grout about the importance of the promise. "It's always been the right thing to do," Brock said. "It's a logistical problem for the center but it becomes a personal problem for the patient. Now patients are diagnosed within 24 hours and are in a surgeon's office in a week with treatment plans being made." That ability to respond quickly to all patients required planning and cooperation, said Aimee Griffin, Director of the Breast Center at Floyd. "My understanding is that in the past at other places, if you were a medical professional or if you knew people who knew people it got you certain treatment, and you would know faster than three weeks," said Griffin. "We asked ourselves 'how can we deliver that level of service to everybody?'" she said. Griffin said the process has gotten so efficient that now, a lot of times if a woman comes in for a mammogram in the morning, they'll get a call about the results after lunch. That is the culture at the center, thanks largely to a dedicated staff of around 35. The Breast Center at Floyd is located on the third floor of the Harbin Clinic Tony E. Warren, M.D., Cancer Center, 225. W. Fifth St., Rome. Call 706.509.6840 to schedule an appointment. Why is the Paper Pink? For the seventh consecutive year, the Polk County Standard Journal has gone pink to recognize October as Breast Cancer Awareness Month. The Pink Paper honors all those who have been touched by breast cancer, from victims and survivors to loved ones who provide help and love along the way. This week's change in color also serves as a reminder from The Breast Center at Floyd, which is celebrating its 10th anniversary educating and empowering cancer patients. Early detection is crucial to successfully treating those with breast cancer. Some 252,000 women in the United States were diagnosed in 2017, and many of those are now survivors thanks to continuing innovation in detection and treatment. 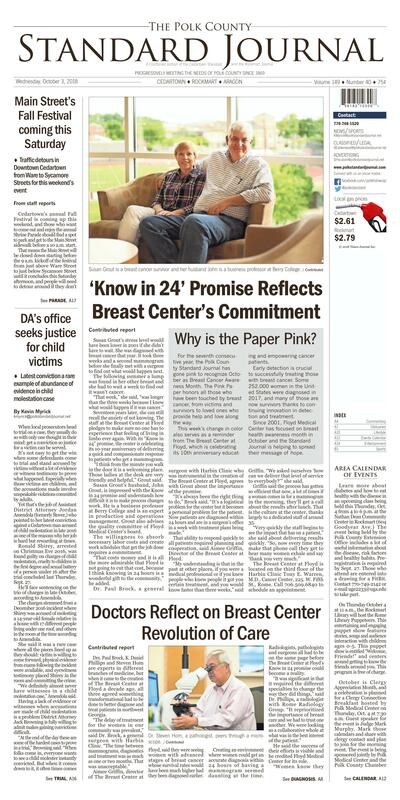 Since 2001, Floyd Medical Center has focused on breast health awareness month in October and the Standard Journal is helping to spread their message of hope. Dr. Steven Hom, a pathologist, peers through a microscope. Dr. K. Daniel Phillips, sitting, and Dr. Paul Brock inspect an image at Floyd Medical Center. come to The Breast Center at Floyd and the will receive the highest level of care possible in a patient-centric way. None of this would have been possible if it wasn't for the administrative support of Floyd Medical Center." Dr. Hom, president of SouthEastern Pathology, P.C., agreed that working together resulted in what was best for the patient, a 24-hour turnaround time. "I can fully appreciate the anxiety produced in having to wait for a result, and reporting results this quickly is very gratifying to us," Dr. Hom added. "The major concern when we began this program was not sacrificing quality for a quick diagnosis and with the help of the histology departments at Floyd Medical Center and SouthEastern Pathology we can have the slides quickly including special stains." Learn more about diabetes and how to eat healthy with the disease in an upcoming class being held this Thursday, Oct. 4 from 4 to 6 p.m. at the Nathan Dean Community Center in Rockmart (604 Goodyear Ave.) The event being held by the Polk County Extension Office includes a lot of useful information about the disease, risk factors and healthy habits. Preregistration is required by Sept. 27. Those who attend are entered into a drawing for a FitBit. Contact 770-749-2142 or e-mail uge2233@uga.edu to take part. On Thursday October 4 at 11 a.m., the Rockmart Library will host the Rome Library Puppeteers. This entertaining and engaging puppet show features stories, songs and audience interaction with children ages 0-5. This puppet show is entitled "Welcome, Friends!" and centers around getting to know the friends around you. This program is free of charge. Commerce. For more information, contact director@polkgeorgia.com. Halloween Hoopla continues this week on Friday, Oct. 5 for Spooky Stories at the Library. Visit polkgeorgia.com for more information about the Halloween Hoopla and other events on the calendar through the end of October. Cedartown's 41st annual Fall Festival is coming up this Saturday, Oct. 6, 2018 from 9 a.m. to 3 p.m., with the annual Shrine Parade kicking off the event on Main Street, with additional festival activities and vendors to follow. Visit Downtowncedartown.com to learn more. Georgia author Mr. Raymond Atkins will be at the Rockmart Library on Wednesday October 10 from 5 to 6 p.m. He will be introducing his latest novel "Set List" which is centered on two young men from Sequoyah, Georgia, with limited prospects and big dreams in the music industry. Atkins is a multiaward winning author and longtime resident of Floyd County. Rockmart Library is pleased to announce a new monthly class that will introduce new users to computers. The first class will be held on October 11, 2018 at 5 p.m. and is free of charge. Space is limited and reservations can be made by calling 770-684-3022. If you are interested in things that go bump in the night, the Georgia Paranormal Investigators will be presenting their best case evidence at the Rockmart Library on October 18, at 5:30 p.m. This unique opportunity will let attendees see various types of evidence collected from real paranormal investigations and ask questions of their own! The public is invited to attend this free of charge event. Anyone who enjoys local history will want to come listen to Georgia author Lisa Russell discuss her newest book entitled "Underwater Ghost Towns of North Georgia." This talk centers on the history of North Georgia's manmade lakes and the towns that were displaced to create them. Russell will be at the Rockmart Library on Tuesday October 30 from 5 to 6 p.m.
Second Baptist Church of Cedartown is hosting the Reaching Every Generation conference which is open to the public to attend from Monday Oct. 22 through Wednesday, Oct. 24. The event kicks off during Sunday, Oct. 21 with a morning worship service featuring Dr. Don Dowless, President of Shorter University and an evening event featuring First Baptist Church of Rockmart pastor Jason Odom. From Oct. 22 through Oct. 24, the evening's speaker will feature Dr. Wayne Bray, the pastor of the First Baptist Church of Simpsonville, S.C. Additionally, an evening meal is scheduled for 5:30 p.m. on Oct. 22 (RSVP for the conference, and especially the meal is required) and worship continues each night at 7 p.m. following. Scarlett Wool will also perform on Tuesday, Oct. 23. Visit sbccedartown.org for more information, call 770-748-5252 or e-mail Pastor Justin Carter at pastor@sbccedartown.org for more information and to RSVP for the conference. Celebrate the Bible Month September with us! Facts and testimonies from and about the Bible! The event is coming up this Thursday, Friday and Sunday, Sept. 27, 28, and 30, from 4 to 7 p.m. at Holloway Park (in front of the Court House). Bible displays and much more. More Info at: 770-748-0077 or 770-715-0419, or by visiting http://www.sda1844.org; www.biblewell.org. The event is being put on by the International Missionary Society of Seventh Day Adventist, Reform Movement. The Polk County Democratic Committee meets on the second Saturday of every month at 9:30 a.m. During even numbered months the group meets at The Rockmart Library at 316 N. Piedmont Ave., Rockmart, and during odd numbered months the party meet at the Cedartown Welcome Center, 609 Main St., Cedartown. All are welcome to take part! Check out more information at the Polk County Democratic Committee by searching for them on Facebook. The next West Georgia Spay/Neuter Clinic is coming to the Cedartown-Polk County Humane Society again on Wednesday, Oct. 24. Head over to the organization's office at 608 Adamson Road, Cedartown, on Fridays from 4 to 7 p.m. or Saturdays from 10 a.m. to 1 p.m. to fill out an admission and prepay for the surgery. Those wanting more information can call 678-361-7304 for more information. Vaccines and tests are available for extra cost as well. Transports won't be scheduled again until Nov. 7 and Nov. 28, 2018.